Clawberta is a unique casual game developed by HyperBeard. 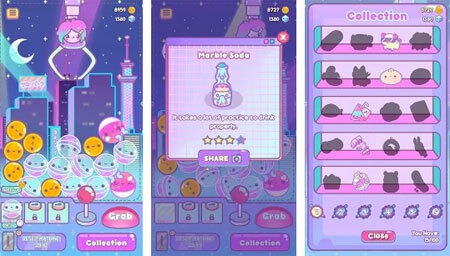 Unlock surprise toys as you explore the neon fevered dream world of Clawberta, the most radical claw machine and U.F.O. catcher. Get your claws on hundreds of kawaii gachapon toys from all over the globe. These toys are just waiting to break out and tell their story. Prepare yourself for cuteness overload. Collect all 100 toys in one world and unlock the next one. Complete your collection for an extra special surprise. Dress Clawberta up with all sorts of trendy hats and hairstyles as you collect toys, coins and gems and solve precious puzzles along the way. If you get stuck in the game, check out the video walkthrough and gameplay for the game. This entry was posted in Android Games and tagged Clawberta Cheats, Clawberta Gameplay, Clawberta Guide, Clawberta Strategy, Clawberta Walkthrough by Marvin. Bookmark the permalink.